14 years. It’s hard to believe – it went by so quickly. Have you always been in your current position? If not, what other roles have you held? I started at the College in 2002 working in Business Affairs Special Projects. I looked at Higher Education as a different type of industry – my previous 21 years had been spent in finance for a high tech company. My first project was to pull together the Operating Statement for a bond re-financing – that was a crash course in higher education statistics. Then I was tapped to be the College liaison to transition our self-op bookstore to a contracted out store. I had never even been in our bookstore before I walked through with Follett’s transition team! What brought you to the College? What kept you here? I moved to Folly Beach fulfilling a dream in 2001. I enjoyed taking some time off and walking on the beach every day. But the itch to get back in the game came back and I noticed an ad for a Special Projects Coordinator at the College. During my interview, I was asked if I had any questions about parking – I naively said no. I had never worked at a company that did not have large, free parking lots! What are some of your favorite memories from over the years? 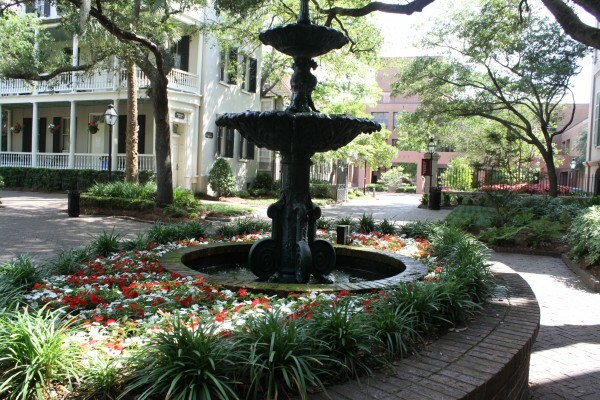 The beauty of the campus, the comradery of everyone in Business Affairs, the joy of having operational as well as financial responsibilities, my colleagues, and most recently being #7 on the 14 Things only a College of Charleston Student would Know List – my new nickname: JBrew! What have you enjoyed most about working at the College? The ability to really make a difference and working with my incredible staff! Seeing some of my visions turn into a reality through the many projects I have seen to completion. I am so very proud of City Bistro! If there’s any sort of advice you’d like to share with your colleagues, what would it be? Don’t put off your dreams. My husband and I have been fortunate enough to travel extensively over the years. I believe in working hard and playing hard. Charleston is a beautiful city surrounded by water – I never get tired of crossing a bridge and seeing the marsh. Heading to St. Kitts in February for a long vacation, then some down time as we wait for spring. Making spur of the moment plans with my friends. Walks on the beach and watching the sun set with a glass of wine! 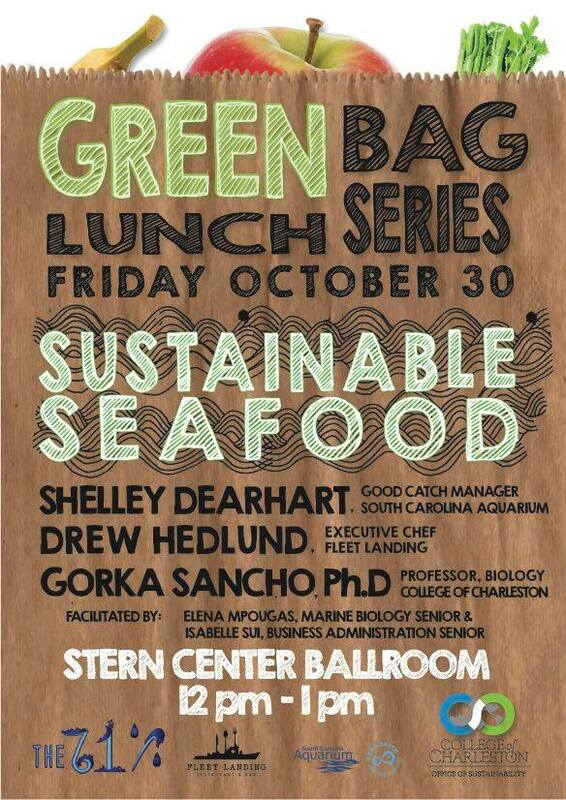 On Friday, October 30, the Office of Sustainability will host the second Greenbag Lunch of the fall semester: Sustainable Seafood. The event will take place from 12:00 to 1:00 PM in the Stern Center Ballroom. As always, attendees are encouraged to bring their own lunch, but light and locally sourced snacks from GrowFood Carolina will be provided. For more information about the Office of Sustainability, visit sustainability.cofc.edu. As a family-friendly work and student environment, the College began work to create spaces around campus for nursing mothers and their infants. 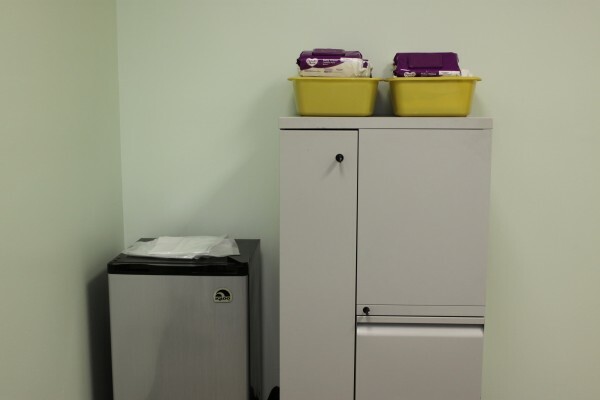 Work to create formal lactation spaces began in the summer of 2014. A temporary space in Robert Scott Small (RSS) was developed and made available for use that same summer. Creation and outfitting of the permanent lactation room in RSS, Room 136, has just been completed. Each of the two private stations has electrical access for pumping devices, plus USB charging ports for electronic devices. Comfortable lounge seating is covered in soft, breathable vinyl for easy cleaning. Lumbar pillows and ottomans were added for extra comfort. Coat/bag hooks are located within reaching distance of lounge chair, as well as lamp switches for softer lighting. Laptop and supply tables are lightweight, portable and within easy reach of each lounge chair. Residential artwork and privacy curtains create a more soothing, intimate space. In addition to the lactation room in RSS 136, there are lactation rooms in the following locations: (1) Addlestone Library, Room 204; (2) Stern Center, the room located next to Room 205; (3) North Campus, Rooms T13 (first floor) and T23 (second floor). The rooms are available for use by all members of the campus community. Access to the room can be obtained by contacting the Office of Human Resources at 953-5512. 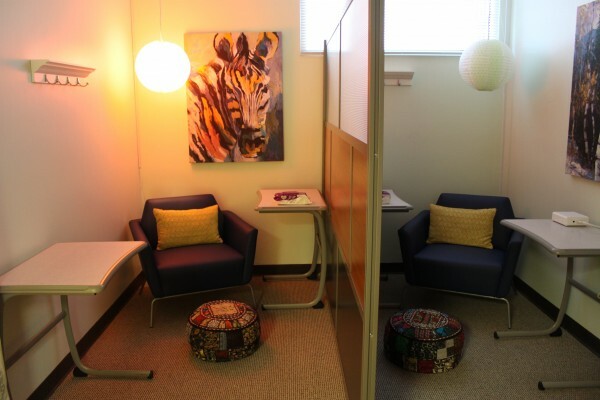 The creation of lactation rooms on campus was a collaborative effort between members of the Divisions of Student, Business, and Academic Affairs. A working committee comprised of Hollis France, Associate Professor of Political Science, Deborah Mihal, Director for the Center of Disability Services, Beverly Diamond, Professor of Mathematics, and Mina McCann, Classification and Compensation Manager for the Office of Human Resources, worked together to help move this project forward. There were also contributions from Ed Pope, Vice President for the Office of Human Resources; Katie Walker, Deputy General Counsel; Michael Turner, Interior Planner + CAD Manager; and Kimberly Gertner, Director for the Office of Equal Opportunity Programs. There is a Lactation Policy which is located on the College of Charleston webpage that provides important information for employees about the lactation rooms as well as using the rooms. The policy may be found at http://policy.cofc.edu/documents/9.3.8.pdf. Greenbag Lunch: To Recycle or Not to Recycle? 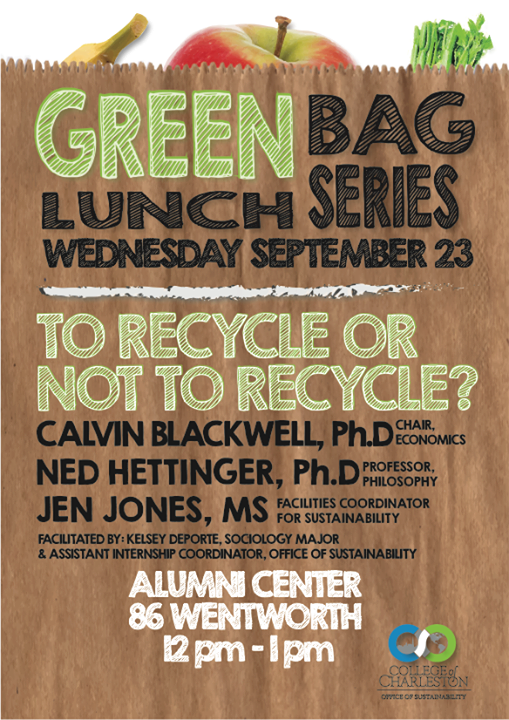 On Wednesday, September 23, the Office of Sustainability will host the first Greenbag Lunch of the fall semester: To Recycle or Not to Recycle? The event will take place from 12:00 to 1:00 PM in the Alumni Center at 86 Wentworth Street. While recycling is often presented as a solution to the global waste crisis, human behavior is one of the most influential aspects of diverting waste. In this round table, participants will discuss both the positive and negative social, economic, and environmental impacts of recycling and how Charleston is working to decrease the amount of waste sent to the landfill. All events in the Greenbag Lunch Series are free and open to the public. As always, attendees are encouraged to bring their own lunch, but light and locally sourced snacks will be provided by GrowFood Carolina. For more information about upcoming events, visit sustainability.cofc.edu/events. New decals promote safety and awareness for the College community. 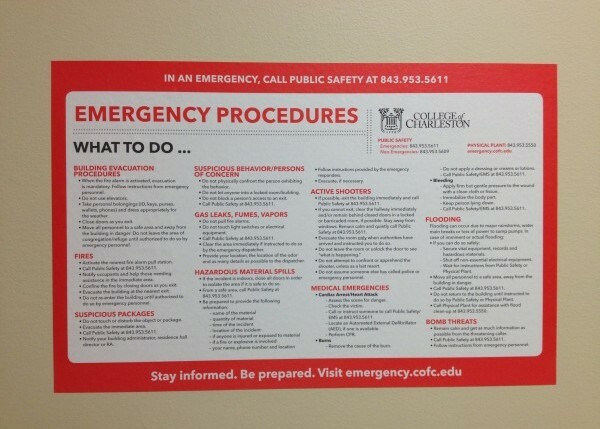 If you have been inside a classroom on campus lately, you might have noticed a new Emergency Procedures decal on the wall. 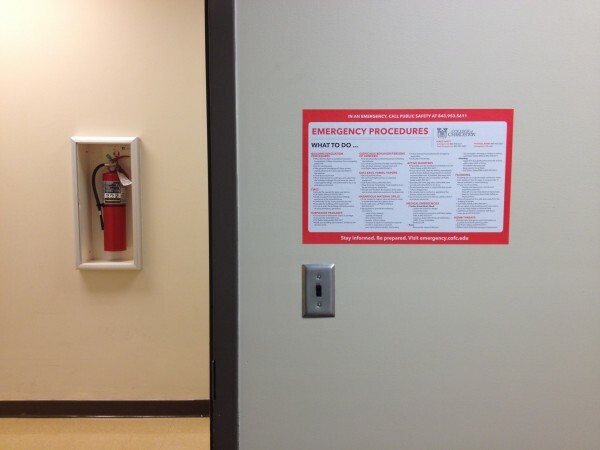 The purpose of the Emergency Procedures decals is to provide reminders and guidance to faculty, staff, and students about proper procedures in the event of some common emergency situations that may occur on campus or in any campus building anywhere. The decals include information about injury, chemical spills, flooding, hurricane, earthquakes, fire, active shooter situations, and other guidelines. Each decal also refers the reader to go to emergency.cofc.edu for more information in time of a major emergency. Public Safety emergency numbers are also published on the decals. The current 11×17 rendition of the decal is based on an initial one designed about 10 years ago by Public Safety. Randy Beaver was assigned with creating a revision of the information and ensuring this information was posted around all campus facilities. Beaver worked with Marketing and Communications, Public Safety, and the President’s Office to create the version that now exists. Beaver was tasked with validating all information, developing a process for distribution, and making sure all campus buildings have this information posted. In addition to the emergency procedures, evacuation and shelter in place maps will be attached to the decal for each location. These will show occupants where to take cover if directed to do so in a shooter situation or severe weather. The individual location maps also show two fire exit routes from each location with ‘you are here’ starts and arrows indicating escape routes. Beaver has already placed around 100 maps himself in order to trouble shoot and see what issues may be encountered before all decals and maps are placed around the College’s facilities. There will around 900 maps and decals (each) installed in all non-resident campus facilities first. Two students will place these maps in all areas near doorways, entrances, and common meeting areas over the next 30-45 days. Following that, maps for residence rooms will be designed and placed in residence halls and student housing. The Grounds Department elevates tradition at the College. For the Grounds Department, going from winter to spring is like going from slow to full speed ahead. The department is busy cleaning up the falling leaves and tassels, putting down mulch, planting spring flowers, fertilizing, and controlling weeds. 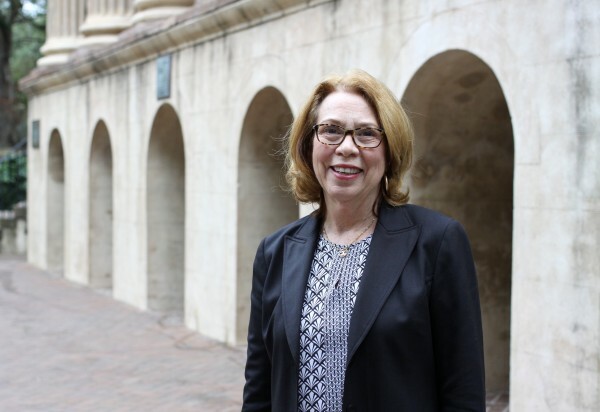 It is a daunting task and Paty Cowden, manager of the Grounds Department, worries every year if her department will be able to get everything done in time for A Charleston Affair and Commencement weekends. For ACA, Grounds assists in the prep for tent staking, keeping the stage and walkways clean, policing the campus for trash, blowing the walkways and roads prior to the events on Saturday and Sunday, and then cleaning up on Monday. Following ACA weekend, Grounds remains busy preparing the campus for Commencement. For the ceremonies, Grounds spruces up all areas where awards and receptions will be held and they decorate the stage with 800 potted geranium, and sunpatiens, along with greenery and Spanish moss that they gather from campus and from Dixie Plantation. The greenery has to be put in water tubes – Grounds uses 500 to 600 every year) so they will stay fresh throughout all the ceremonies. Prior to the ceremonies, Grounds polices the campus and uses leaf blowers to clear the stage and walkways. Additionally, they clean up Cistern Yard between ceremonies. Thanks to Paty and her Grounds crew, the College’s campus remains pristine for all commencement ceremonies. On Monday following commencement weekend, Grounds cleans up the stage and Cistern Yard so the Spoleto crew can begin their set up. And then, as Paty says, Grounds heaves a big sigh of relief that it’s all over for another year! This department administers the campus card system consisting of 95 point-of-sale and card reader devices, controls the ability to use privileges and various facilities across campus, reconciles campus commerce via Cougar Cash and Dining Dollars, and manages meal plan selections and financials. We make ID cards, too! How many employees are there in your department? What are the total years of experience/service (sum of all employees) in your department? What are some statistics that you’re able to share? Thus far in FY15 $1,945,317 has been spent via the Cougar Card. We make about 6,500 ID cards each year. Are there any services that your department offers that the College community might be unaware of? As of April 2015, employees are able to add funds to their ID card accounts via MyCharleston. Employees may purchase a block of 25 meals for $155 for use in Fresh Food Co. or City Bistro. If a drink or snack machine malfunctions please report it to us, we gladly issue refunds too! Notary Public service is free! Are there any additional facts you would like to share? I serve the Office as the new Internship and Student Coordinator. I work with our 25 interns on sustainability projects across campus, plan workshops, field trips, and other events to promote personal and professional development! I also work with outreach programming in different aspects of student life and collaborate with Residence Life, Sorority and Fraternity Life, Civic Engagement, and Student Life. In addition to the internship program, I also plan our office events including Sustainability Week. My department works to implement sustainability into the campus and community. We work in a lot of different areas including research and academics, zero waste, student life, and alternative transportation. 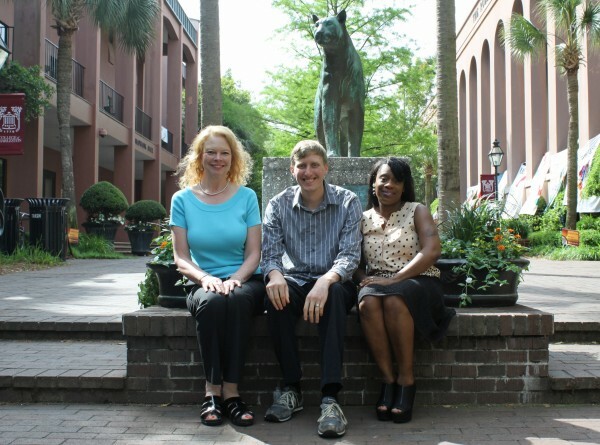 We really work with a ton of offices and departments to build a more sustainable CofC. One of the main functions of our office (and my role!) is to prepare students for life after graduation through providing real world experience and opportunities for both personal and professional development. I started as an unpaid intern with the Sustainability Office the first semester it opened – fall 2011. I worked as a Graduate Assistant from 2012 until the new position started this spring. 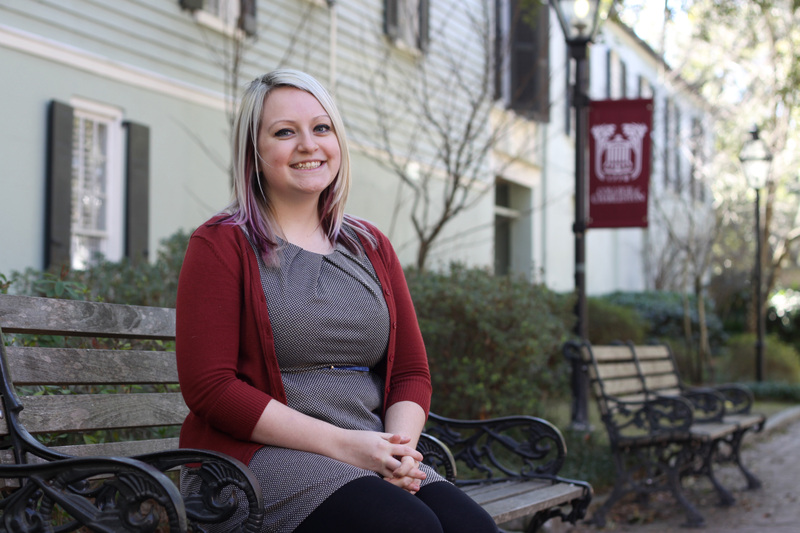 As a Graduate Assistant, I helped to manage and grow our internship program while also working with outreach programming, as well as other projects focusing on student life and development. In January of 2015, I was given the opportunity to do this full-time! After moving to Charleston from Cleveland Ohio in 2006, I was able to transfer into the College from Kent State University in 2009. I finished my undergraduate degree in Political Science and Russian Studies and decided to continue my education through the Masters of Environmental Studies Program. Over my nine years here, I have come to love the College and the community of Charleston; our office has become a second family to me. I LOVE working with students and I feel so lucky to be able to do this full time! We have such a variety of students from different backgrounds and majors working on a ton of projects that there’s never a dull moment. Student development is such an important aspect of higher education, but not really at the forefront of academics, so I love that we can provide this opportunity at our office. I really enjoy helping students work through issues and being a part of their growth process. They also help me see and work on areas I need to improve on as well. Our students are solving big problems and there are both frustrations and rewards that go along with that; I try to be there for both the successes and regrouping. For me, sustainability isn’t really about renewable energy or water refill stations, it’s about preparing students at the College to be change agents and game changers so after graduation they have the skills and confidence to go out in the world to create change. What are some of your favorite memories from the College? I have so many favorite moments at the College! One of the most memorable for me is making A Charleston Affair zero waste last year (2014). It was a goal of ours for so long and we worked so hard to achieve it. I remember Jen Jones texting me at 2:00 a.m. (after about 15 hours of prep and work during the event) to say that she thought the numbers showed we diverted over 90% of the total waste generated from the landfill. Such a rewarding moment for us! As a Russian Minor, I really love Russian culture, language and history– I nerd out on Russian folklore and politics! My family is of Eastern European ancestry so I enjoy cooking Hungarian and Polish foods for friends. Over break I traveled to Germany– absolutely loved the country– and I hope to travel more. I also really like watching college football and relaxing outside. What is something that your colleagues would be surprised to learn about you? I LOVE planning themed parties! I particularly enjoy planning parties around sports like the Olympic Opening Ceremonies, World Cup, and NCAA Football Rivalry Weekend, but also love other themes as well. 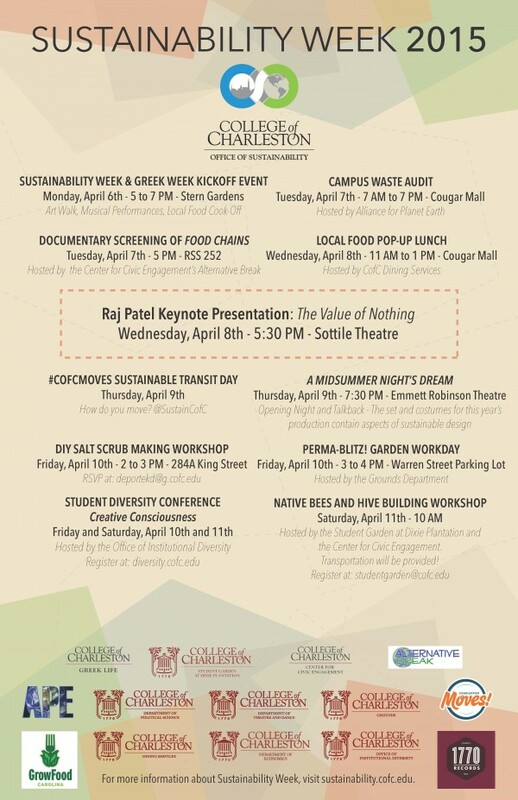 From Monday, April 6 to Saturday, April 11, the Office of Sustainability will host a series of events for the College’s fourth annual Sustainability Week. This year’s events incorporate the idea of redefining value. Whether this is valuing ourselves, others, and products, the events aim to get people thinking about how value is attached to things and the difference of value versus cost/price. Join us for the kickoff event for the College’s annual Sustainability Week and Greek Week from 5-7pm at Stern Center Gardens! A collaboration with the CofC Fraternity & Sorority Life, CofC Office of Sustainability and 1770 Records, the kickoff event will feature a local food cook off competition between Greek organizations, an art walk, and concert featuring creative works around the theme of engagement, social justice, community, and sustainability. The event is free and open to the community. Hope to see you there for great food and great jams! Alliance for Planet Earth’s main mission is to create an active sustainability culture between members of the community and to promote the importance of landfill diversion. As part of Sustainability Week, they will be sorting through trash collected from different facilities around campus such as dorms, cafeterias, and classrooms into various categories to determine how much could have been diverted. Interested in volunteering? Email allianceforplanetearth@gmail.com to sign up! Join the Migrant Labor Health Miami Alternative Break Group in their screening of the documentary Food Chains. The film discusses the human aspect of our food system by presenting the current issues faced by farmworkers in Immokolee Florida. Join College of Charleston Dining Services and the Office of Sustainability in Cougar Mall onWednesday, April 8th from 11-1 for a special Pop Up Lunch featuring a dish comprised of all local produce from GrowFood Carolina and Limehouse Produce! Dr. Patel is a passionate economist and activist who has authored several insightful books critiquing world food systems and the effects of globalization while providing hopeful and sustainable solutions. Patel specializes in economics and received degrees from the University of Oxford, the London School of Economics, and Cornell University. For a short time, he worked for the World Bank and the World Trade Organization and has become one of their most outspoken critics. Patel’s keynote speech will be based on his book, The Value of Nothing: How to Reshape Market Society and Redefine Democracy. The event is free and open to the community. How do you move? Do you walk, bike, or use public transit? Join the Office of Sustainability and participate in the College’s first official event celebrating the different modes of transportation that the College community uses to commute to campus. On April 9th, during Sustainability Week, let us know how you move by using #CofCMoves and post to @SustainCofC on Twitter, Instagram, and Facebook! The set for this year’s production will feature aspects of sustainable design. Tickets are $15, but are only $10 for CofC students/faculty/staff/seniors. Join us for a D.I.Y. workshop on how to make your own salt scrub at CofC’s Office of Sustainability! This workshop will be a hands-on experience where participants make their own salt scrubs and learn about various natural ingredients and their healing powers. Participants will be able to hand select their own ingredients to tailor them to their individual needs. The Office will supply all materials, including jars and ingredients. It’s time for a sustainable makeover- permaculture style! Come out and get dirty at our first ever perma-blitz on campus hosted by the College’s Grounds Department! We will be building a garden as a community-flash mob but garden style-at the Warren Street apartment parking lot, so the more hands, the merrier! Bring your bandana and meet us at the front entrance of the parking lot (between 10 Warren and 20 Warren) for a community garden build workday and some good ol’ fashion fun! Our final workshop of this semester, Native Bees and Hive Building, will educate students about the importance of protecting our bee populations and be a hands-on experience where students will create habitats that attract pollinators, at the end of the day they’ll get to take home their own bee house made of wood and other found materials. This event is part of Spring into Service. Transportation is provided! Space is limited. Please register at studentgarden@cofc.edu. The Sottile Theatre has many events a year, all with varying degrees of complexity and components. This is where a technical director (TD) comes into play. The TD ensures that all technical aspects of any given show are executed smoothly and that the client is happy. The Sottile Theatre brings all types of art to the Charleston area and to the College of Charleston. I was working as a temporary employee for the College for approximately 3 years. I came on as a full-time employee this past October. I was attracted to the College by its history and promotion for the arts. Additionally, there are some wonderful people here at the college and it is a pleasure to work with them. The thing I like most about my job is that I’m able to be a part of all kinds of shows. Everything from large national operas, dance companies that have been doing shows for years, to small productions doing their first show. 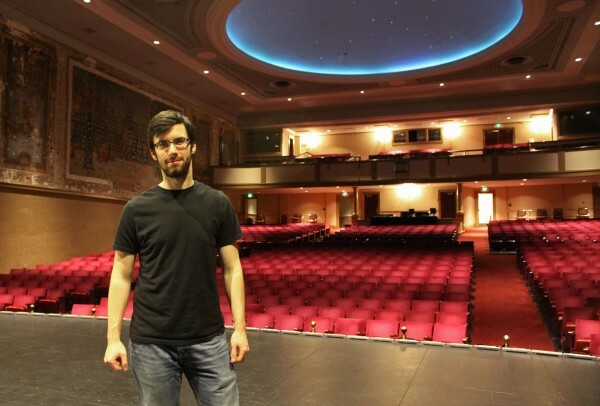 I would have to say some of my favorite memories from my time at the College are the late nights spent at the theatre. After a long day of tech and rehearsals, the crew relies on humor to break up the stress. I would have to say my biggest interest would be technology. Ever since I was a pre-teen in thick glasses, I was taking apart computers and small engine motors just to see how they worked. Something that most of my colleagues would not know about me is that if I’m not at work or resting at home, I’m out working on a 20 acre horse farm tending to either the animals or the land itself.